It is a remarkable story and one few economists or economic historians have examined. Even more remarkable is the fact that this vast monetisation program did not prove to be inflationary. 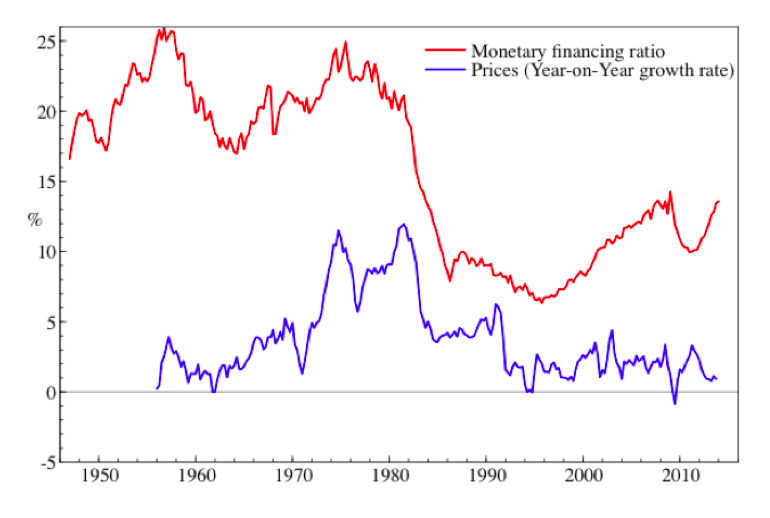 As can be seen in Figure 1, there is no relationship between the growth rate of consumer prices and the ratio of debt held by the Bank of Canada or the government. An econometric analysis of the relationship between monetisation and inflation again found no evidence of a significant correlation – rather, Canadian inflation was mainly influenced by U.S. inflation. Interestingly, the Bank of Canada was created in the mid-1930s not to support the financial sector but in response to a perceived failure of the banking system to provide sufficient credit to farmers suffering in the Great Depression. It was given a strong public service mandate and required to make interest-free loans to the government and municipalities for infrastructure, which it duly did up to the mid-1970s. At this point, monetarist theory took over and the Bank sold off vast quantities of government debt to private investors. Canadian monetary reform campaigners COMER recently hired a high profile constitutional lawyer, Rocco Galati, to sue the Bank of Canada for reneging on this commitment. Whatever the outcome of the legal case, the example of Canada is a great reference point for monetary reformers. The Bank of Canada did not follow the prescriptions of mainstream monetary policy: it was not fully “independent” of the government, it had a wide mandate focusing on full employment, support for small businesses and industry, and the reduction of government debt, and it used a number of different “tools,” including credit guidance and “moral suasion,” to influence the commercial banking sector. At a time of high private and public debts, deflation, and stagnant growth, monetary policy makers would do well to study the Canadian example and see how monetary financing is possible and has been successful in creating a vibrant and stable economy. The CANSIM data table is actually 176-0022 that is cited in the endnote provided here. Data tables are 7 digits and I called up CANSIM to try and find the one given but found this instead, which seems to relate to the same info. you can search 176* to find all 176 data tables at the CANSIM section of Statistics Canada. That aside, good job to everyone involved! So excited to read this through fully! That’s consistent with the backing theory of money (aka the real bills doctrine). When the central bank issues 10% more money, it normally gets 10% more assets in exchange. It’s just like a corporation that issues more bonds, while at the same time (of course) getting more assets. Everyone agrees that this wouldn’t affect the value of the firm’s bonds (or stock), but economists fail to apply the same logic to the issuance of money.